Laptops already have their own display battery level but unfortunately, these are fairly basic information without specific details. BatteryBar is a tool that is located in the taskbar so as to show you a complete detail about your battery. 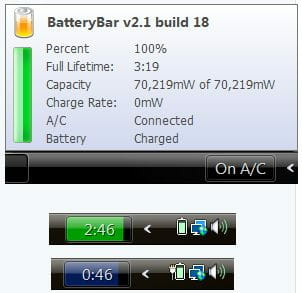 Battery level: providing a major advantage for Windows users, the battery level indicator is integrated with Windows. And this is the case for all Windows version. After downloading and running the application, an icon will directly be placed on your taskbar to display in real time the percentage of your battery level. Details: just hovering over the icon with the mouse, users can view detailed information about the battery status. Among them, the icon will be displaying the charge rate, capacity, wear rate and the maximum life. Precise indications: to facilitate the information, BatteryBar has been endowed with color coding. For the green color, it means that the load is greater than 40%; with the yellow bar, the load is between 25 and 40%, and for the red color, less than 25%. The software gives the exact minute before shutting down the computer. It does not take much space on the hard disk. Latest update on November 20, 2016 at 06:14 PM.